Ahmedu Augustine, popularly known as BlackfaceNaija, is a dancehall artiste and a member of now defunct boy band – Platashun boiz. Other former members of the Platashun boiz are Innocent ‘Tuface’ Idibia and Faze (Chibuzor Orji). The Platashun boiz split in 2004 as each member of the band went solo. Tuface Idibia went on to become the most successful artiste from the band and one of the biggest artistes in Africa after the release of his hit song, African Queen. 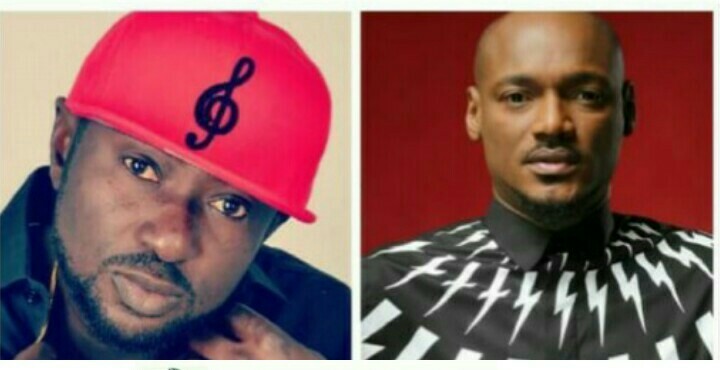 Meanwhile Blackface has called out Tuface and his management, countless times, saying they stole his intellectual property – ‘African Queen’and ‘Let somebody love you’, as he is one of the writers of the song. Idibia’s manager debunked the claims, saying Blackface has been getting royalties due him. 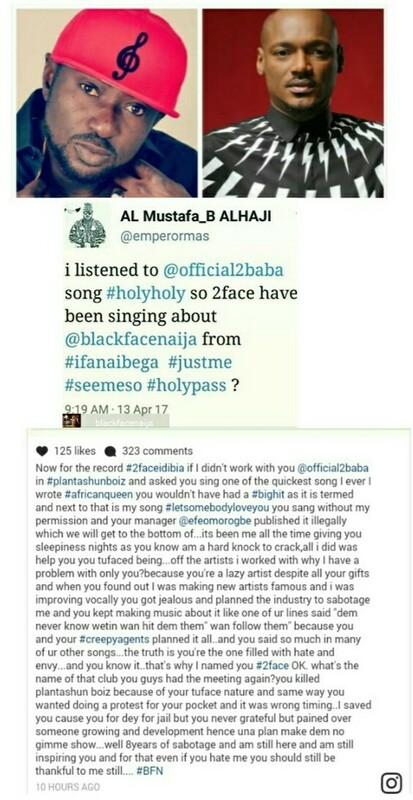 More recently, Blackface bashed Tuface on Instagram, saying Tuface’s new song ‘Holy Holy’ was about him. In this recent interview with Premium Times Blackface explains his relationship with 2face Idibia and the reasons behind their unending ruckus. PT: What have you been up to recently? BFN: My recent work is my 6th album, which I titled DEFENDER VOL1. It took me over 6 years to finally put an album out again after so long and this is because I wrote so many songs. So, because my fans have missed me so very much, I am making it in two volumes; the first (Defender Vol 1) is out on iTunes and you can find it on some digital sites as well. PT: You have been somewhat quiet in the music scene? BFN: Yes, I have been quiet and this is because some persons are plotting to make Nigerians turn their back on BlackfaceNaija because I stand for what they don’t stand for. They are jealous and hence been plotting for years over seven years to keep me out of the industry by labelling me names and putting out false information about me so the corporate bodies wont engage my services. And hey, they are doing a good job at it so far, I must tell you; that’s why you say I’ve been quiet. I say this because I remember I had put some videos out like KILLAH and some other singles but no radio or TV agreed to play my music for the fans. So, I hope you all know now why I’ve been quiet all these while. PT: You have retained your dancehall style of music for over a decade. Have you ever been tempted to switch to a more commercial brand of music? BFN: I make dancehall music a lot because it fits my grooves and my mood when I make music, I just increase or lower the tempo and then branch out to other types of music be it RnB or hip-hop. I make music as it comes really without thinking commercial or non-commercial; when the tunes are more groovy that’s what you term commercial but slow music isn’t groovy. But it can be very commercial long as people like the tune, theme of the song and vocals of the artiste. Music fans won’t hesitate to buy it. So, yes if that’s what you mean. I’m making some new music that this new generation will want to have in their archives because my music is different from the rest. We artistes have different brain wave, different vocals and style of rendition. PT: You are regarded as one of the dancehall music pioneers in Nigeria. Are you satisfied with the appreciation of dancehall music in Nigeria? BFN: I really am not happy with that because the genre isn’t embraced much here but it’s one genre that can be used to speak volumes and talk about the ills of society and how to solve it. Dancehall music also teaches us how to live in peace and harmony, as that’s what the culture around the music promotes. But, here in Nigeria, reality feels more like a slap on our face; people would rather sell out than speak the truth. The media won’t put out the truth to educate the people but anything that can pay their bills. I think that should be addressed because it’s corruption and killing the growth of the entertainment industry. PT: What are you most unhappy about in the Nigerian music sector? BFN: A lot of things that is not right. Like artistes remaking songs of another artiste outside the shores of Nigeria thinking there is no copyright law. If you dig deep, a lot of your favourite artistes are guilty of this and it makes us look bad. Also, a lot of artistes find it difficult to pay for studio sessions and pay producers their fees. Some also find it hard to print CDs and to get generous airplay in radio or TV stations. So, it breaks me when an artiste says they have to pay money to get their music played when they should be getting paid to play their songs. I find that horrible and it should be looked into. We need more content providers to spring up and record labels and banks should look into sponsoring labels and independent artistes. PT: What roles do these artistes themselves have to play? BFN: Artistes should also develop the attitude of performing live. Vocal piracy is also a big issue and artistes need to desist from it. The government has to act now in the aforementioned sectors, as they are responsible for the society we find ourselves. PT: You have been very critical of your former band mate 2face of recent on social media. Don’t you think it’s better to reach out to him in person rather than the social media outbursts? BFN: The medium doesn’t matter. What matters is that he and his people get my message. PT: Since you accuse 2face of intellectual theft have you considered taking legal actions against him? BFN: Yes, I have; and my legal team is working on that, as that’s the best way to go. When I accused them, they lied and said its ‘unfortunate’. I said they took my song and then even said maybe my account was hacked. Well, if you thought so why didn’t you pick up your phone and say “Yo black.. . What’s going on?’ But, no they won’t because they wanted to steal it and it backfired, and they trying to act ‘holy’ so they make flimsy excuses. 2face and his manager planned all of that. 2face sang my song (Let Somebody Love You) and featured an American artiste, Bridget Kelly. His manager published it without my permission. Till today they haven’t deemed it fit to tell the world that they tried to assassinate my character in the media but that couldn’t be justice and they know. So, the court is our only option as they keep avoiding meetings thinking that with time it will all fade off. But, they know not what tomorrow holds and neither do I.
PT: Do you regret the fact that Plantashun Boiz split and do you think the group would have survived this long? BFN: I don’t regret the music I gave to the fans during that era. It was a starting point for me…a learning curve as I am still learning a lot from all the stuffs they did to give me a bad name. But I was born to do this (music) and I can’t stop and definitely not now. PT: Did you foresee the breakup? BFN: For real, with all that I know now, I am really surprised how we lasted that long and even made such records, Jah knows best. PT: What major lessons have you learnt in your career and life so far? BFN: They can’t stop the rising sun and they can’t stop the rain from falling. PT: Why are you closer to Faze since you have known 2face the longest? BFN: I wish I can explain that but I can only say Faze is the way he is and that makes me close to him. He is a natural and one bad (very good) vocalist and writes too. We both make some magical music like ‘Don’t You Know’, ‘For Example’,’Can’t Live’ and so many other tracks that we are yet to release. We might make more music if he is ready to work against all odds for the fans. PT: As a renowned songwriter, will I be correct to say that African Queen is your biggest song yet? BFN: It’s a huge song and I always thought it will be that big when we (Platashun Boiz) used to sing it for fans under the trees in 201 road in my late uncle, Captain Moses’ retired, place in Festac Town. Nobody had that sort of melody or style at that time, so it was bound to be a hit. PT: Are you enjoying royalties from it? BFN: All the facts about those will be known soon because there is so much unfinished business around the song since its release till date. And all the royalties will have to be traced and paid to whom it’s due. PT: Are you satisfied with the level of your career? BFN: I only want to improve and make more music; that’s all I crave for. I also want to be able to perform for my fans; slow and steady yes I am and I know it can only get better. PT: Do you have any regrets in your career so far? PT: If you could begin your music career all over again what will you do differently this time around? BFN: I would be a solo artiste from day one.